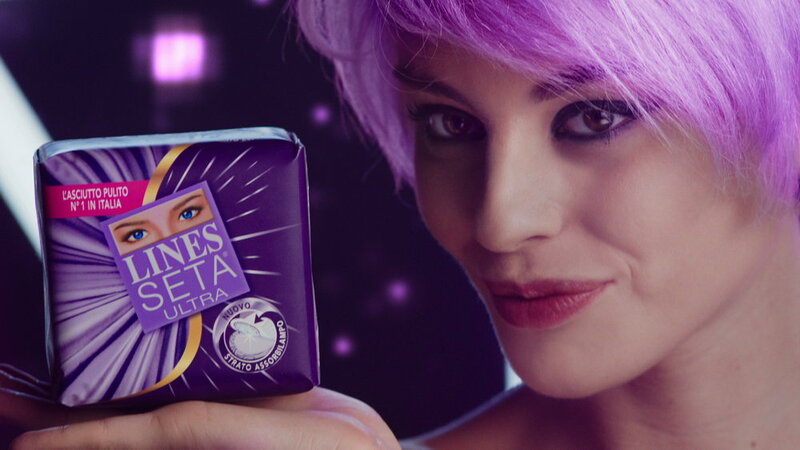 The setting is the symbolic world of fashion – it’s realistic, lit up with purple lighting like the package of Lines Seta Ultra, here a beautiful, ultra modern elegant girl, whose short silver haircut with purple highlights makes her even more original is the protagonist of the new campaign, on air from November 25th on main TV channels and the web. Refined, lively music, introduced by the singing of "Seta Seta" accompanies the rapid sequence of images that, with the help of the gigantic neon words VELOCITÀ, ASCIUTTOPULITO and ZERODORE(SPEED, CLEANANDRY and ZERO ODOUR), emphasises the distinctive qualities that make Lines Seta Ultra unbeatable. The protagonist is relaxed and lively as she walks along the neon letters with a smile, interspersed with rapid demonstrations of the superior quality of the product which a voice over describes. 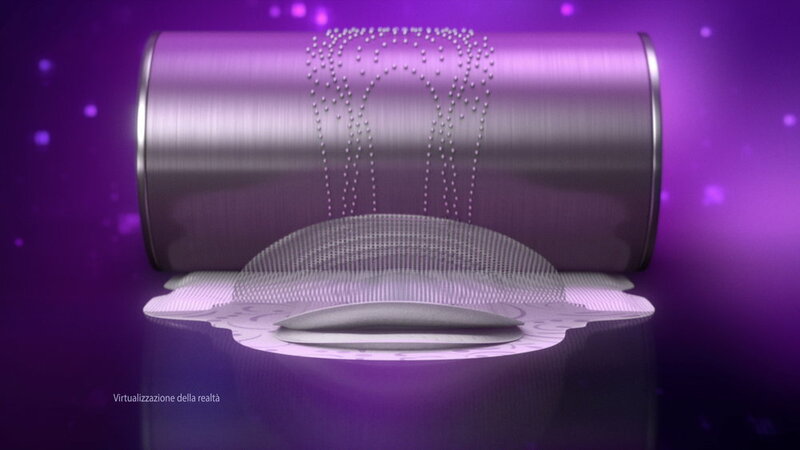 We see that if the filter does not adhere firmly to the pad, an annoying wetness can be experienced, while Lines Seta Ultra with more than 500 micro-dots ensures the filter adheres firmly to the newAssorbilampolayer. An oversized roller with more than 500 small luminous reliefs is used for a demo - passing over the product, it brings all the layers together and secures them. Result? "ASCIUTTOPULITO (CLEAN AND DRY)in a flash!" Comparison with another ultra pad that does not absorb so quickly and remains wet confirms this. Then we see the protagonist walking near the word "ZERODORE" (ZEROODOUR):the lights go out on all the letters except the O of ZERO, because with Lines Seta Ultra there is zero odour! 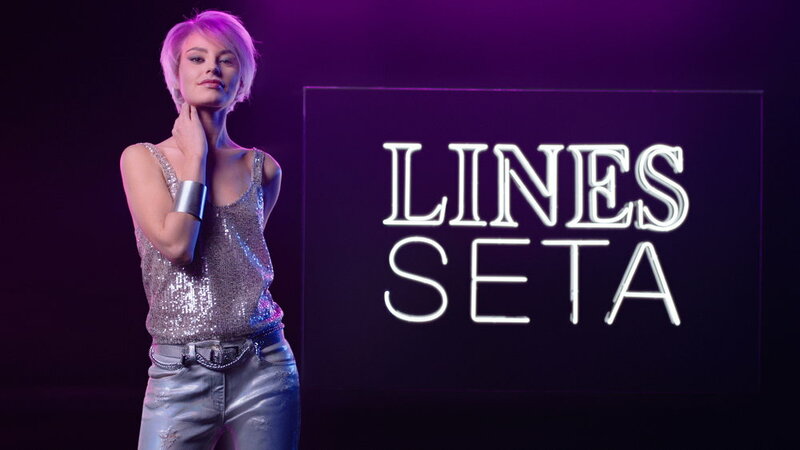 The film closes with the girl smiling and playing with the pack next to the word LINES SETA that lights up and goes off with the typical sound of neon lights accompanied by the singing of "Seta Seta" and the claim: Lines Seta Ultra, unbeatable confidence!